If your University of La Verne club or organization would like to host a rock painting, download the reservation form. The Rock is the property of the University of La Verne. Approval to reserve the Rock is under the discretion of the Office of Student Life and is only reserved for recognized clubs and organizations. Only the Rock should be painted. The Rock skirt area, located around the Rock, should be left unpainted at all times. Clubs and organizations are responsible for purchasing their own water-based paint. When you reserve the Rock you have access to paint the Rock at NOON the day it is reserved and your reservation then continues until noon the following day. Do not paint over another club or organization’s Rock until noon on the day you have reserved it. 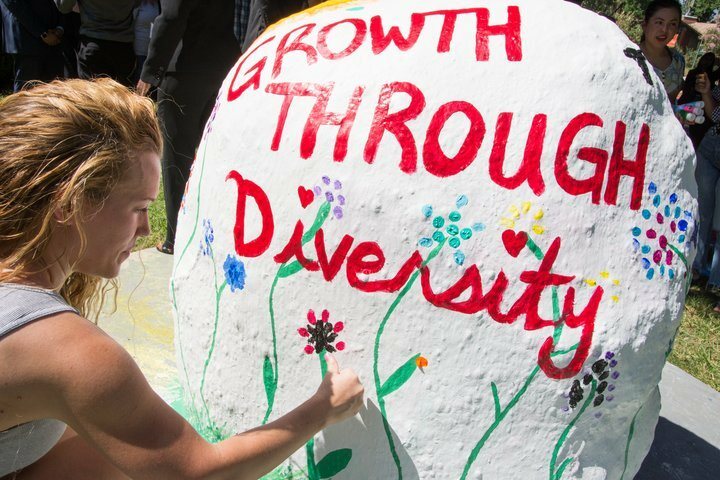 You may only paint the Rock on the days that your club or organization has reserved it. Each recognized club or organization, can reserve the Rock a maximum of six (6) times each semester. All reservations will be processed on a first come, first serve basis starting the first day of the Fall or Spring semester. You can’t sign up for more than two days consecutively. Towards the end of each semester if there are still open Rock dates, a club can come back and request more than six dates. Paint brushes and other supplies cannot be washed in any of the University bathrooms. Failure to fill out this form in its entirety can result in refusal of your request. If you require tables or chairs for your Rock Painting you must contact Events at least 72 hours prior to your Rock day. All requests to reserve the Rock must be approved by the Director, Associate Director or Club and Organization Coordinator in the Office of Student Life, either in person or via email.